Don’t miss your chance to learn about healthy aging trends and research at the 5th Annual Elder Friendly Futures Conference, Sept. 15-16, 2016 at the Lynnwood Convention Center. The conference is open to older adults, healthcare providers, community professionals, research educators, students and anyone else who is interested in learning about healthy aging and how to be part of an elder friendly future. Early-bird registration ends Aug. 31. Register today for a reduced fee! This year’s conference theme is “Multiple Voices Shaping our Communities.” The conference will feature research and program presentations on topics and trends in the field of aging. It will also include roundtable discussions, poster sessions, informational exhibits, a film viewing and discussion, a bookstore and many opportunities for networking. See the complete program schedule. Grow Old: Elder-friendly communities enable people of all ages to actively interact with each other, showing mutual respect, regardless of age. These communities promote livability through housing, transportation, health services, social participation, civic participation and communication. Multiple Perspectives on Healthy Aging: This discussion examines findings from focus groups of professionals in the field of aging and links them with the perceptions and experiences of older adults. Both groups share the goal of finding best practices that promote healthy aging. Artistic Expression for Persons Living with Dementia: Painting, storytelling, improv, dance, songwriting – engaging in these creative, artistic activities enables people living with memory loss to express their strengths. Learn about the growing arts engagement programs offered throughout King and south Snohomish Counties and how they are contributing to the health and well-being of those with Alzheimer’s and related dementias and their care partners. 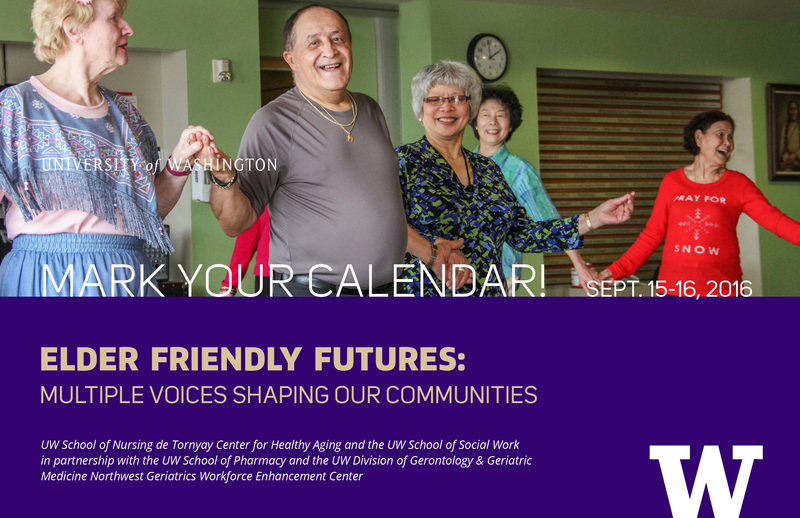 The conference is co-presented by the UW School of Nursing de Tornyay Center for Healthy Aging and the UW School of Social Work in partnership with the UW School of Pharmacy and the Northwest Geriatrics Workforce Enhancement Center in the Division of Gerontology & Geriatric Medicine. Visit elderfriendlyfutures.org for more information, to register or to become a sponsor.